How I Gained It: I gained some weight after high school and through college, despite being a college athlete. I have always considered myself active, despite not really having a workout plan at the time. I have three children, and with each pregnancy, I gained 85 pounds -- yes, 85! 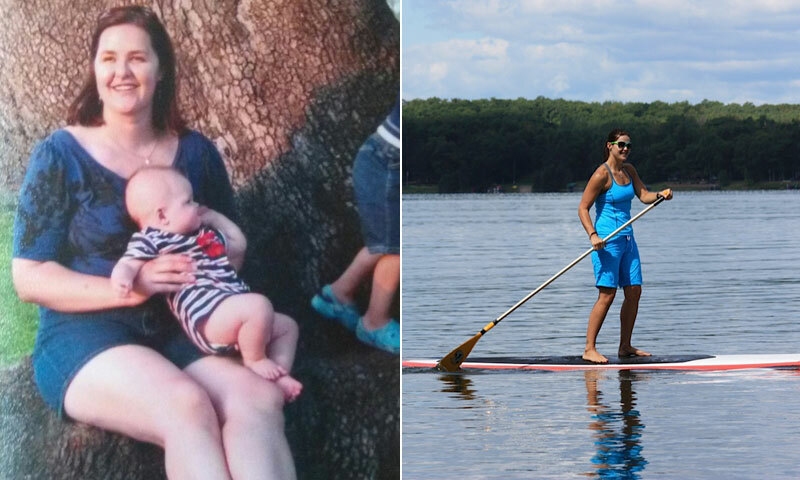 I worked hard -- really hard -- after each one of my sons was born to take the weight off, but with advancing age, it became harder to lose the weight after each pregnancy. After my third son was born, I weighed 267 pounds and felt miserable. Breaking Point: The instant I saw myself in a picture after my son came home from the hospital! I had always been into fitness and health, but this picture did not reflect it. Seeing it made me feel sad -- almost in disbelief. I became stubbornly determined to do something I never thought I'd have to in the first place. How I Lost It: I tried taking up running, which helped me lose some of the weight, but I didn't listen to my body and ended up with a herniated disc in my back, which required surgery. That delayed my weight loss. Two years later, I developed a heart arrhythmia, which required heart surgery. With that, I had some serious issues with anxiety, particularly with exercising again and raising my heart rate. Yoga helped me with my anxiety, which helped me get back to working out in the gym regularly. I have had to find non-impact ways of losing the weight -- cycling, StairMaster, walking. I've been so successful that I weigh less now than I did in college and before I had children! I do yoga and high intensity interval training (HIIT). I walk my dog regularly. My favorite workout is BODYPUMP at my local YMCA. With a family, sometimes that means going to the gym at 4:30 a.m. I have also really cleaned up my diet. I try to eat clean and limit my sugar intake. I used to eat so much sugar! Now, after cutting way back, I honestly don't crave it. I actually crave healthy food, because I love how it makes me feel. My muscles also crave exercise, and that's a winning combination. I feel so much stronger. Seeing a difference daily in how good I feel is empowering. Do I still have some of my favorite foods? Yes. Only now, I limit the amount and think of it more as a reward. I'm always online searching for yummy healthy recipes. I have seen the depth of my husband's love for me at every stage, weight and bump in the road. My children know how to make healthy choices, and love to be active -- that makes a mama proud.